Though it may seem remote, getting to Kenya really isn't all that complicated. The country is located in East Africa, surrounded by Somalia, Ethiopia, Tanzania and Uganda. Except when you’re coming from some neighbouring countries, practically the only way of traveling to Kenya is by air. Kayak.com automatically finds the cheapest tickets to Kenya from over 140 travel sites and networks in just moments. All the major travel networks are included so you don't have to search at all these sites yourself. The other one is Vayama.com , which is especially meant for travelers from and to the United States and Western Europe. Vayama pulls the cheapest air fares to Kenya from over 100 airline sites. They often return more results than any other booking engine online. 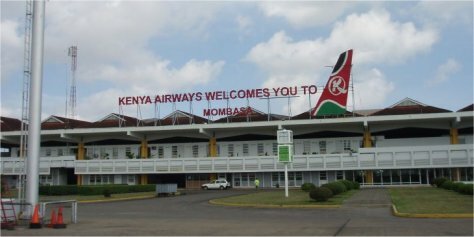 Most flights to Kenya come in through Jomo Kenyatta International Airport in Nairobi. Nairobi is still the safari capital in the world, and close to popular national parks like Masai Mara National Reserve and Amboseli. Some chartered flights from Europe also use the smaller Moi International Airport in Mombasa, at the coast. This is especially convenient if you’re heading for the popular beach resorts. Eldoret Airport in western Kenya will probably also increasingly be used, as tourism in western Kenya is being developed now. Eldoret Mount Elgon and the Kakamega forest are closest. Here’s an overview of all airports in Kenya. All in all, many airlines fly to Kenya, but there are no direct flights from the USA, Canada or Australia. Here’s my page with all the details about available flights to Kenya. If you are already in the area and want to come to Kenya by land, there are limited routes you can take. Sudan and Somalia, to the north, are so politically unstable and unsafe that travel over land is virtually impossible. Ethiopia is so too, but to a lesser extent. About the only border points, at Moyale and Fort Banya, are closed regularly. So better take flights if you’re getting to Kenya from there. The best options for land travel is to come from Uganda or Tanzania. The border points between Tanzania and Kenya are Taveta, Namanga, Lunga Lunga and Isebania. There are bus connections over these border points, but no train connections anymore between Tanzania and Kenya. The main crossing on the border with Uganda is at Malaba, with Busia being the other option if you’re traveling via Kisumu. There is a major road between Nairobi and the Uganda capital of Kampala that travels through Malaba. There are several public bus lines that can bring you into Kenya from Malaba, either to Nairobi or one of the other large cities. It’s possible to hire a car in Kenya but it’s expensive with complicated (and costly) rules around insurance. At Kenya’s south-western border, there’s the huge Lake Victoria. Apparently there are no ferries at this time crossing the lake from Tanzania or Uganda to Kenya. There are private boats (dhows), but many are involved in smuggling and you better avoid them. On the south-east Kenyan border, there’s the Indian Ocean. It’s possible to get by boat to the Tanzanian islands of Zanzibar and Pemba, but by private boat only. Most people traveling to Kenya for tourism purposes need a visa. The easiest way to get them, is after arrival at the airport. A single entry visa (valid for 90 days) is US$50, a multiple entry visa US$100. Most people can also get a visa from the Kenyan embassy in your country before traveling to Kenya, but this takes more trouble and time. See my page about visa requirements for the details and the exceptions to these rules of thumb. Whether you choose an easy and comfortable intercontinental flight, or an adventure by local roads, you will enjoy getting to Kenya as much as actually being there.